Here are comments and photos from folks who've stayed at Entabeni Cottage overlooking the Pacific Ocean above the world famous "Road to Hana" on the north shore of Maui in the Hawaiian Islands. 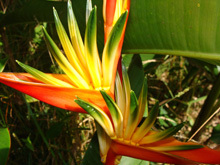 Note: See some of the 400 varieties of tropical and sub-tropical plants at EntabeniGardens.com. • In his Camping America blog, Gerry Feehan of Alberta, Canada included this photo (see below) when writing about Entabeni Cottage, "We had absolute privacy, from the gorgeous ocean view to the solar-heated outdoor shower. The north wall of the cottage consists entirely of glass doors. Each morning we awoke to a 180-degree view of the ocean." • "We loved the outdoor shower and used it daily. We love the peace and quiet, the view, the privacy... Our kind of place." • "Entabeni Cottage is an oasis of peace, comfort, and life! How liberating to shower outdoors in the pouring tropical rain, and how lovely to dry off on the porch watching a rainbow kiss the sea. This week of relaxation and rejuvenation was a blessing. Thank you for all your considerations, in each comfy detail, and for your hospitality in sharing this taste of heaven with us." • "Your place is such a paradise within a paradise." • "We have enjoyed our stay here so much more than we ever imagined! The cottage is exactly what we were looking for - quiet, beautiful and full of the magic we hoped to find in Hawaii! Thank you for sharing your amazing produce with us. Our dinners were outstanding and breakfasts with the fresh fruit were amazing as well. We also loved the impromptu tour of the stunning garden you've created here. Thank you, thank you. We hope to be back again." • "Your cottage and property are so beautiful! Thank you so much for your generous hospitality and for sharing the fruits (and eggs) of your labor so that others can enjoy the absolute beauty of this area! I'm so glad we took the time this morning to take it easy and enjoy breakfast out on the back patio. Absolute gorgeousness and beautiful tranquility." • "We were looking for a quiet place to recharge our spirits. This was the place." • "What a treat! We feel like we discovered our own secret hideaway in the rainforest." • "On the Island of the Sun, Entabeni Cottage rekindled the aloha in our spirit souls." • "From the moment we arrived, this cottage took our breath away. The welcoming candles, fresh flowers tucked all around, and the tasty fruit were all wonderful touches. The wood stove kept us cozy as we reveled in our good fortune to spend time here." • "Stunning. The view, the bed, the wind chimes, even the quiet of the rain was stunning. I slept like I've never slept and your hospitality was amazing. The eggs were wonderful. I can't wait to come back." • "This is our kind of place - so peaceful, beautiful, private - the Hawaii we love! Michael's tour was informative and fascinating and the fresh vegetables, bananas, & eggs were a treat. We loved the cottage and its open feeling. Had the best coastal hike yet (out of 100's) from Wainapanapa State Park south towards Hana." • "You have a wonderful place. It has been perfect for me, far better than any hotel; my best stay in Hana ever, and I've had many." 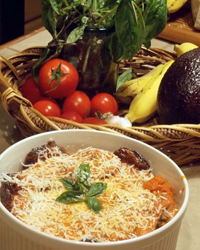 • Tony and Kelly sent us this photo (see left) and wrote, "Eggplant parmigiana with scratch sauce all from your garden. Thank You!" • "I got nuts in that amazing kitchen and loved cooking delicious dinners. The bed was super comfy." • "Thank you for your wonderful hospitality! We so enjoyed staying in your cute cottage. It is so peaceful here, a nice change from the West side (of Maui). Thank you for the delicious produce. We made some delicious meals out of it. We hope to see you again!" • "Really enjoyed your little cottage; the fire and everything. The bed was good as well. The fish and eggs were delicious." 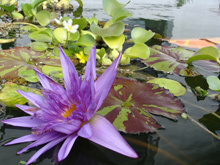 • "Thank you so much for the wonderful two weeks in your cottage. We enjoyed the comfortable and modern equipment, especially that all was clean. With your good wood burning stove, we had it warm all the days. After two weeks of exploring and hiking, we can recommend the following trails: Trail from your garden to secluded waterfall, Waimoku Falls Trail, Wainapanapa Coastal Trail to Hana, Waihee Ridge Trail, Sliding Sands Trail, Nature Trail at Hosmer Grove, Kaupo Trail, and Hoapili Trail." • "What a wonderful place you have here; so peaceful, tranquil, relaxing. We absolutely loved Entabeni Cottage and can't wait to come back to spend more time. Thank you for everything! We loved the eggs, all the veggies, herbs, and especially the personal tours. You have a place of heaven here and we loved every minute - just wish it could have been longer." • "I loved the rain, the birds, gardens, and forest. The eggs too - they taste so much better fresh!" • "Our stay at Entabeni Cottage has been surreal and we have loved every second of it! It's been a real pleasure spending time chatting with you. Thank you for everything, including the eggs (Yay! ), fresh fruit and veggies, and herbs. It will be hard for us to leave tomorrow." • "A piece of heaven on Earth; the bed, the shower, the greenhouse, the guinea hens, the eggs. But most of all... THE HOSTS! Thank you Michael & Terry for letting us into your world and spoiling us forever." Note: Why so many comments about our eggs and produce? 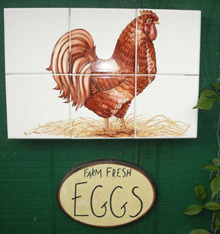 We often provide our guests with fresh eggs from our chickens and produce from our garden. We hope to add your comments to this page! Contact us for more information about Entabeni Cottage.